Jaguar Mining Reports 2017 Fourth Quarter and Financial Results; Strong Operating Cost Performance | Jaguar Mining Inc.
Toronto, March 29, 2018 – Jaguar Mining Inc. ("Jaguar" or the "Company") (TSX: JAG) today announced details of the Company’s financial and operating results for the fourth quarter (“Q4 2017”) and year ended December 31, 2017 (“FY 2017”). Complete Financial Statements and Management's Discussion and Analysis are available on SEDAR and on the Company’s website at www.jaguarmining.com. All figures are in US dollars, unless otherwise expressed. Operating costs decreased in Q4 2017 by 19.8% to $15.5 million, compared with $19.4 million in Q4 2016 due to focused efforts on delivering profitable production and company-wide expense reduction programs. Net income of $16.0 million and earnings per share $0.05 compared to net loss of $9.3 million and ($0.03) net loss per share in Q4 2016. Increased realized gold price of $1,278 per ounce, compared to $1,205 per ounce for Q4 2016, partially offset lower gold sales in Q4 2017. Revenue of $26.6 million, compared with $30.3 million in Q4 2016 due to lower production in Q4 2017. Cash operating costs (“COC”) of $745 per ounce sold, compared to $735 in Q4 2016 and $809 in Q3 2017. All-in sustaining costs (“AISC”) of 1,104 per ounce sold, compared to $1,098 in Q4 2016 and $1,168 in Q3 2017. Operating cash flow of $5.4 million, in line with expectations. Invested total capital of $6 million, including $4.9 million in sustaining capital expenditures. Free Cash Flow was $0.5 million and negative $5.1 million for Q4 2017 and FY 2017 respectively, based on operating cash flow less sustaining capital expenditures, compared to $2.3 million and $12.4 million in Q4 2016 and FY 2016 respectively. 2018 gold production guidance of 90,000–105,000 ounces. Cash balance of approximately $18.6 million as of December 31, 2017, compared to a cash balance of $19.2 million at September 30, 2017. Lower year-over-year gold production of 84,152 ounces compared to 96,608 ounces in 2016. Net loss of $2.8 million and ($0.01) net loss per share compared to net loss of $82.8 million and ($0.50) net loss per share in 2017. Invested total capital of approximately $24.6 million in 2017, which yielded significant exploration success from $4.6 million invested in exploration drilling. Increased definition, infill and exploration drilling metres by 28% to 48,498 meters compared to 2016. Cash operating costs of $837 per ounce of gold sold and AISC of $1,212 per ounce of gold sold. As at December 31, 2017, the Company had a cash balance of $18.6 million, compared to a cash balance of $26.3 million, as at December 31, 2016. During the fourth quarter, the Company received $2 million from Avanco for the second installment of the Accelerated Earn-in Agreement signed for the Gurupi Project on September 17, 2017. Stable working capital of $14.1 million as at December 31, 2017 compared to $11.3 million as at December 31, 2016. 2018 guidance for Turmalina Gold Mine (“Turmalina”) and Caeté Mining Complex (“CCA”) Pilar Gold Mine (“Pilar”) and Roça Grande Mine (“RG”). Pilar production guidance increased to 39,200 - 47,000 reflecting re-forecast for increased mineral resources reported in March 2018. RG performance reflects production from January 1 to March 21, 2018 as RG temporarily placed on care and maintenance. The Company completed 13,973 metres and 48,498 metres of definition, infill, and exploration drilling during the three and 12 months ended December 31, 2017, respectively (Q4 2016 and FY 2016 – 9,914 metres and 37,860 metres respectively) focused on current orebody extensions at depth at both Turmalina and Pilar. Total Measured Resources increased 277% to 317,000 ounces of gold, net of depletion, grading 4.47 g/t. Total Measured and Indicated (“M&I”) Resources increased 10% to 532,000 ounces of gold at 4.37 g/t. Inferred Resources increased 104% to 433,000 ounces grading 5.69 g/t, reflecting successful growth exploration drilling campaign in 2017 targeting high-grade deeper extensions to the principle banded iron formation orebodies. Proven and Probable (“2P”) Mineral Reserves of 125,000 ounces of gold, grading 3.99 g/t reflecting two-year replacement of mineral reserve depletion through production and addition of new mineral reserves. M&I Resources of 420,000 ounces of gold reflect full replacement of 45,000 ounces of 2017 mining depletion for Orebodies A, B and C. Measured Resources increased 8% to 265,000 ounces with a 6% increase in grade to 5.7 g/t. Inferred Resources increased 158% to 305,000 ounces of gold with a 14% increase in grade to 5.49 g/t, reflecting successful growth exploration drilling campaign in 2017 targeting high-grade deeper extensions to the orebodies. Jaguar Mining Inc. is a Canadian-listed junior gold mining, development, and exploration company operating in Brazil with three gold mining complexes and a large land package with significant upside exploration potential from mineral claims covering an area of approximately 64,000 hectares. The Company's principal operating assets are located in the Iron Quadrangle, a prolific greenstone belt in the state of Minas Gerais and include the Turmalina Gold Mine Complex and Caeté Mining Complex (Pilar and Roça Grande Mines, and Caeté Plant). The Company also owns the Paciência Gold Mine Complex, which has been on care and maintenance since 2012. Additional information is available on the Company's website at www.jaguarmining.com. This news release provides certain financial measures that do not have a standardized meaning prescribed by IFRS. Readers are cautioned to review the above stated footnotes where the Company expanded on its use of non-IFRS measures. Cash operating costs and cash operating cost per ounce are non-IFRS measures. In the gold mining industry, cash operating costs and cash operating costs per ounce are common performance measures but do not have any standardized meaning. Cash operating costs are derived from amounts included in the Consolidated Statements of Comprehensive Income (Loss) and include mine-site operating costs such as mining, processing and administration, as well as royalty expenses, but exclude depreciation, depletion, share-based payment expenses, and reclamation costs. 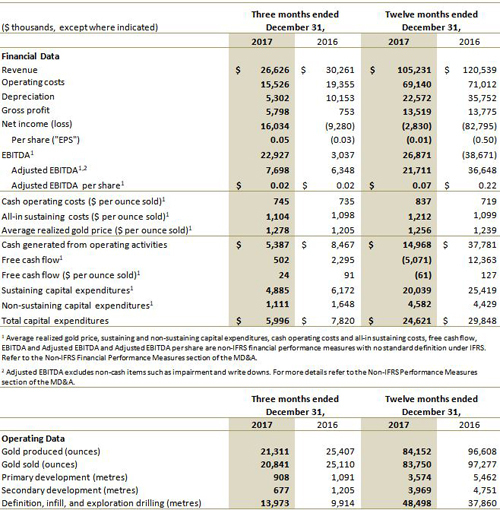 Cash operating costs per ounce are based on ounces produced and are calculated by dividing cash operating costs by commercial gold ounces produced; US$ cash operating costs per ounce produced are derived from the cash operating costs per ounce produced translated using the average Brazilian Central Bank R$/US$ exchange rate. The Company discloses cash operating costs and cash operating costs per ounce, as it believes those measures provide valuable assistance to investors and analysts in evaluating the Company's operational performance and ability to generate cash flow. The most directly comparable measure prepared in accordance with IFRS is total production costs. A reconciliation of cash operating costs per ounce to total production costs for the most recent reporting period, the quarter ended December 31, 2017, is set out in the Company's fourth quarter 2017 Management Discussion and Analysis (MD&A) filed on SEDAR at www.sedar.com. All-in sustaining cost is a non-IFRS measure. This measure is intended to assist readers in evaluating the total costs of producing gold from current operations. While there is no standardized meaning across the industry for this measure, except for non-cash items the Company's definition conforms to the all-in sustaining cost definition as set out by the World Gold Council in its guidance note dated June 27, 2013. The Company defines all-in sustaining cost as the sum of production costs, sustaining capital (capital required to maintain current operations at existing levels), corporate general and administrative expenses, and in-mine exploration expenses. All-in sustaining cost excludes growth capital, reclamation cost accretion related to current operations, interest and other financing costs, and taxes. A reconciliation of all-in sustaining cost to total production costs for the most recent reporting period, the quarter ended December 31, 2017, is set out in the Company's fourth quarter 2017 MD&A filed on SEDAR at www.sedar.com.